Exploring the depth of language and thought has always been at the forefront of Las Vegas-based artist Krystal Ramirez’ work. In her most recent exhibit, I Want to See, Ramirez’ recurring themes of rigorous process, pattern, and repetition continue her dialog on thought and experience. As a secondary thread, Ramirez’ monochromatic palette works to distinguish and separate herself from her work as an editorial photographer. Leslie Ventura, staff writer at Las Vegas Weekly, examines Ramirez’ body of work as a discourse on anxiety, expression, and communication rooted in the artist’s Chicanx identity. In addition to her work as a multidisciplinary artist, Ramirez is also a staff photographer at Vegas Seven. Krystal Ramirez Untitled 2011, chromogenic print 4″ x 6″. From the Disintegration exhibition. Painstaking process and repetitive practice are the signature of Ramirez’ work. 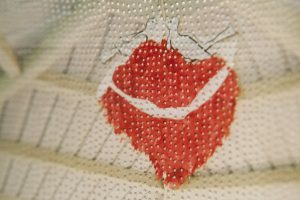 Using a thin needle to punch holes into her photographs, Ramirez created ephemeral textures that constituted a sense of intimacy in her 2011 show, Disintegration, inside the former Kleven Contemporary gallery. 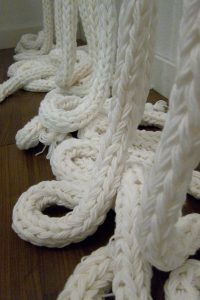 Krystal Ramirez Untitled 2011, ropes, white yarn, wooden flooring, 8′ x 15′. From the Disintegration exhibition. Ramirez works with different mediums to create tedious, visually compelling objects. 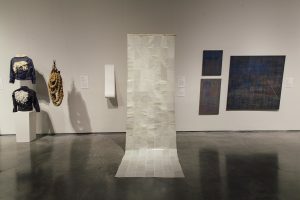 In Disintegration, she used simple, unassuming materials like white yarn to construct a 15-foot-tall, 8-foot-wide rope sculpture that encouraged viewers to meditate and detach from the pressures of living in a technological world. Krystal Ramirez Untitled 2011, handwritten pieces, paper, ink, pencil, 4′ x 2′. From the Disintegration exhibition. 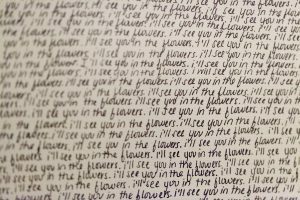 Krystal Ramirez Untitled (detail) 2011, handwritten pieces, paper, ink, pencil, 4′ x 2′. From the Disintegration exhibition. A daughter to blue-collar, Mexican-immigrant parents, Ramirez’ Chicanx identity is intrinsic to her laborious handwritten works, which draw upon her own personal anxiety and privileged upbringing. Having grown up witnessing her parents work long, tiring hours in construction and in casinos, Ramirez’ lengthy process and obsession with repetition represents an outward expression of internal conflict and endurance. At 2-feet-tall and 4-feet-wide, these nine panels work in tandem to break down emotional barriers while dealing with the stigma of depression and guilt. Krystal Ramirez Untitled 2013, onion skin, typewriting paper, ink, pencil, 10′ x 5′. From the I’m Sorry We Lied exhibition. Expanding on her ruminations in Disintegration, Ramirez’ 2013 exhibit, I’m Sorry We Lied, at Winchester Cultural Center explored the intimacy lost in our perfection-obsessed, Internet-based culture. By collecting hundreds of photographs taken while her subjects slept, Ramirez removed all sense of control, leaving her subjects in a vulnerable state of imperfection. 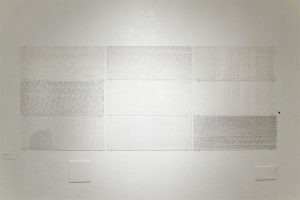 The accompanying handwritten installation, which included over 300 sheets of phrases and statements written on typewriting paper, served as an additional dialog on society’s obsession with perfection and identity. Krystal Ramirez Emptiness 2016, rag paper, ink, folded: 1′ x 4′ unfolded: 1’x 9′. From the Tilting The Basin exhibition. Vulnerability as a constant theme is most apparent in Ramirez’ 2016 installation, Emptiness. Part of the 2016 exhibition Tilting the Basin: Contemporary Art of Nevada inside the Nevada Museum of Art in Reno, Ramirez’ scroll details a series of her own alcohol and drug-induced blackouts. Written as one run-on sentence, Ramirez’ stream of consciousness anecdotes are folded to maintain an element of intimacy and privacy, evoking a sense of embarrassment that parallels society’s shame toward mental health issues. 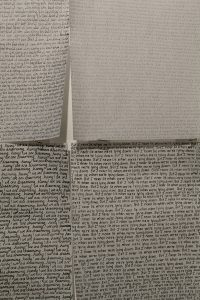 By making the text hard to read, Ramirez forces her audience to fill in the gaps of her story, simulating the artist’s own unease while confronting her own forgotten memories. Krystal Ramirez Paradigm 2016, Bible paper, ink, pencil, sewing thread, polyurethane, 9’x4′. 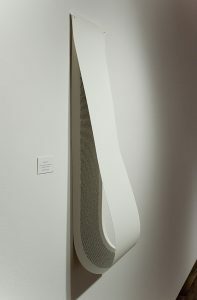 From the Tilting The Basin exhibition. A reflection on her respect for process and patience, Paradigm is an exercise in both stamina and control. The 9-foot-tall, 4-foot-wide piece comprised of handwritten messages on numerous white panels was also part of Tilting the Basin, and was on display through October of last year. Ramirez juxtaposed soft materials like Bible paper and sewing thread with her mechanical and fervent technique, creating a daunting work in both size and scope. Krystal Ramirez I Want To See 2017, Bible paper, latex paint, synthetic glue, sewing thread, 12′ x 15′. Ramirez’ latest exhibition, on display at the County Government Center in Las Vegas, is a sculptural floating panel inspired by the 1970s Chicanx art collective Asco. 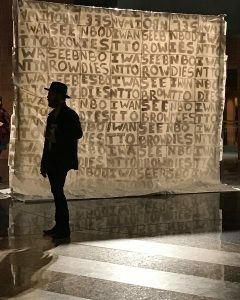 The group’s critique of the lack of Chicanx people in the contemporary art world directly informs Ramirez’ statement, “I want to see brown bodies.” Inspired by the group’s temporary Guerilla art tactics, I Want to See exists as a contemporary homage to the radical art form. Fragmented and disjointed, the phrase allows the viewer to explore the unlimited potential and subjectivity of language. 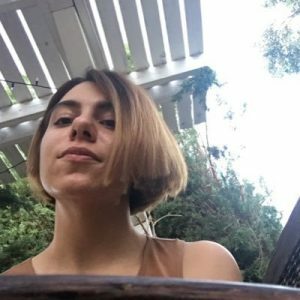 Leslie Ventura is a staff writer at Las Vegas Weekly with a penchant for independent music, social issues and arts and entertainment. In 2016, she was awarded journalist of merit and best feature writing by the Nevada Press Association.